Choosing a new paint color can be easy if you’re willing to have a little patience. 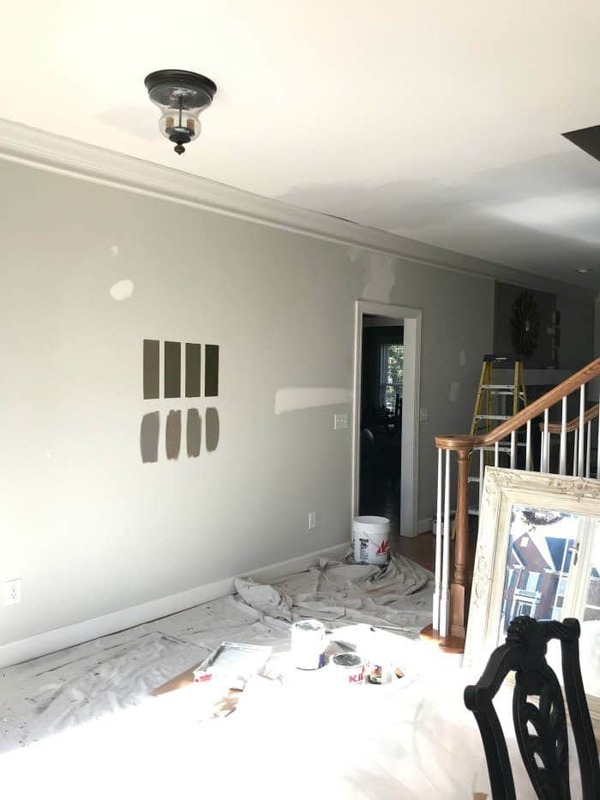 Find out the names of all my living room paint samples options in this blog post. First of all, thank you to everyone who messaged me about the living room makeover. Everyone was so sweet and I appreciate it very much. The room feels cozy and I can finally say it is done. OK, except for a few art pieces I want to create. I will be sure to share all of the details of that as it unfolds. Right now, it’s a secret. 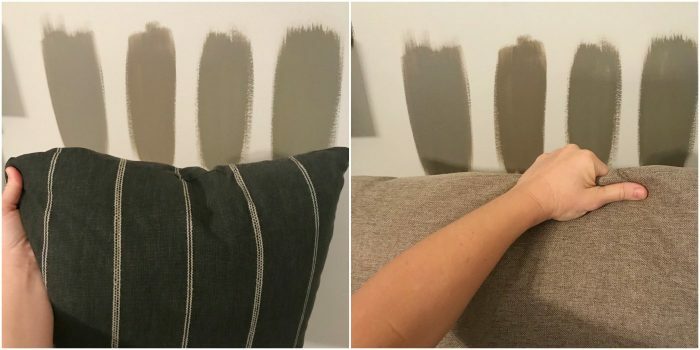 Many of you followed along on Instagram stories as the real time living room paint samples were applied. I received lots of messages about all of the colors. I thought the best way to share would be to make a blog post here. That way it will be all together and easy to reference later for anyone. Be sure you pin it to one of your boards so you can have when you are ready to paint. Or pin to share with your followers. Sharing is caring! I started the process by getting 4 paint samples. The criteria for the new color was dark with a slight olive tone. The first 4 colors (on the top row) were all good colors but my gut was telling me I didn’t have it just right yet. Spending money on samples sometimes seems like a waste of money but it is a very important step. It is important to see a color on your walls and how it looks at all times of the day. 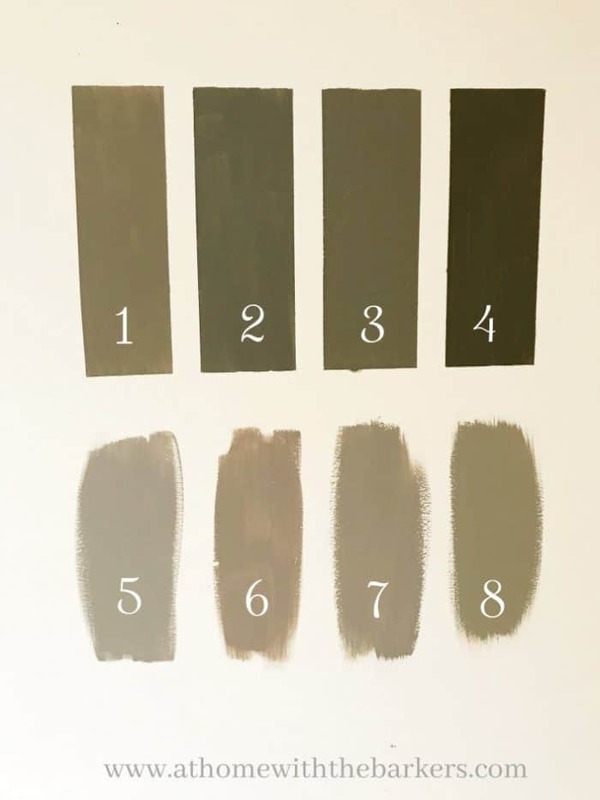 Samples are step one in choosing the right paint every single time. Picking 4 more colors I headed back to Home Depot to get them mixed. Putting the sample paint colors on different walls is must for my living room. It has light coming in from the front and back of the house. Especially needed to make sure the color we chose worked well with our new furniture and our stone on the fireplace. 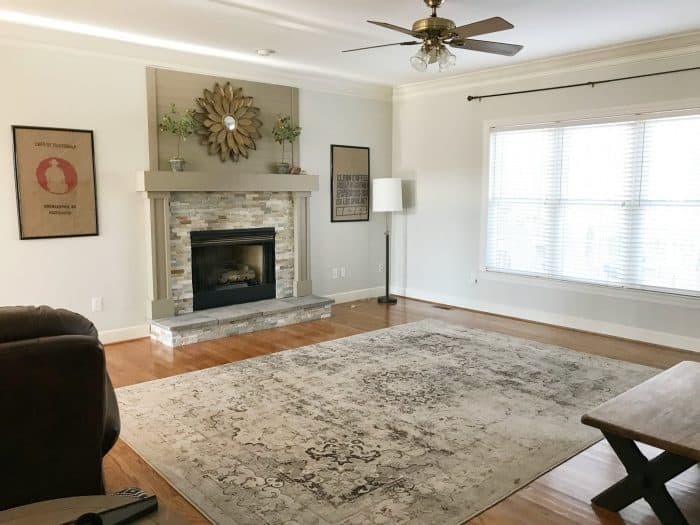 Our DIY fireplace makeover is a favorite project of ours. You can click here to see how we turned a builder basic fireplace into our stone beauty. I landed on really liking #5 and #8. Ray and I both agreed on #8 so Adaptive Shade is the new living room color. 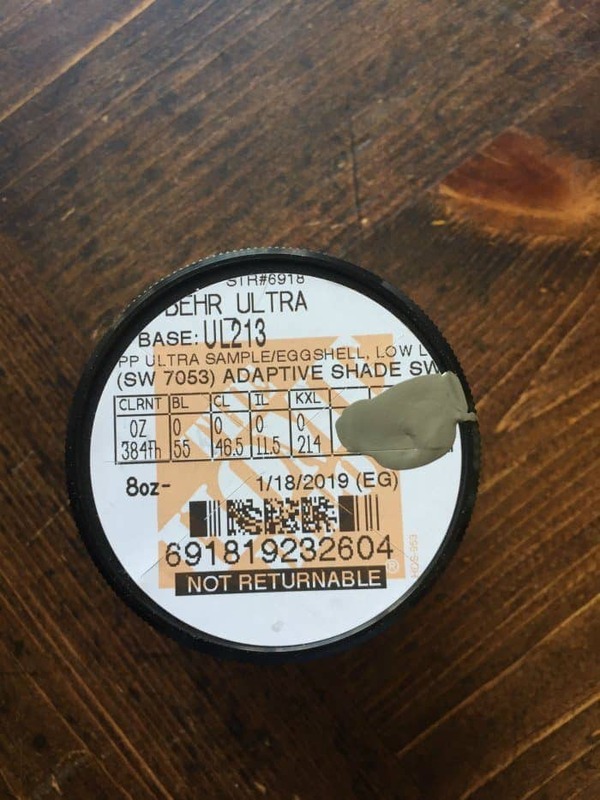 I had my local Home Depot mix the Sherwin Williams color in the Behr Premium Plus Paint and Primer. This paint covers well, low VOC, and good price. Before deciding for sure on the color I wanted until out new furniture arrived. The sofa color was the one I was mostly concerned about coordinating with the paint. The color can change other things around it and I did not want the new sofa to look wrong. Our living room makeover! 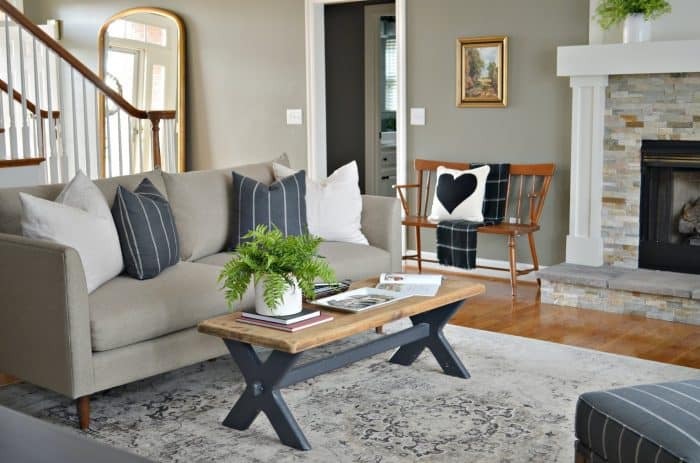 Click HERE to see the full room reveal. 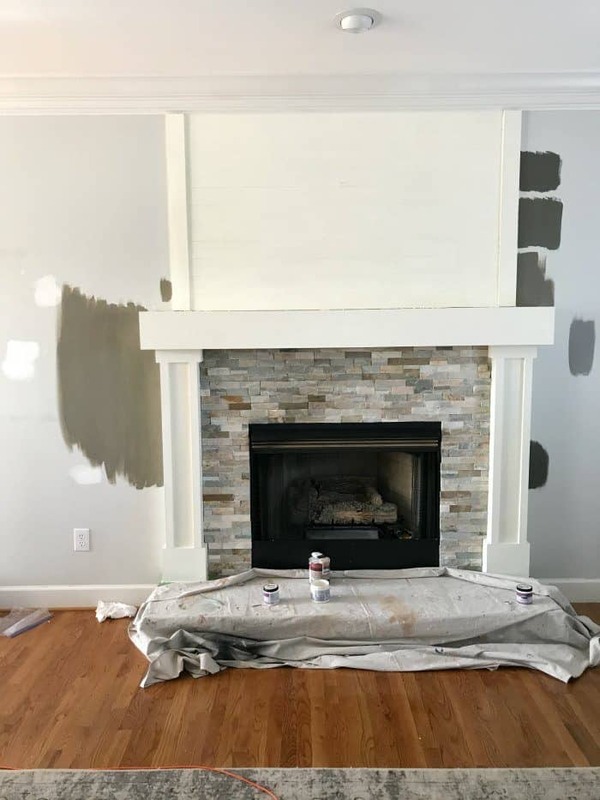 I will be back on later this week sharing the details on painting the fireplace.